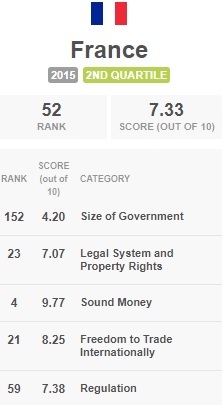 I like France, in part because it’s a nice place to visit, but also because I’ve been able to use the country as an example of bad public policy. It’s tax system is a nightmare, leading entrepreneurs to escape to other nations (hardly a surprise when tax rates can exceed 100 percent and politicians equate taxes with patriotism!). In some cases, tax rates are so punitive that revenues fall rather than rise. 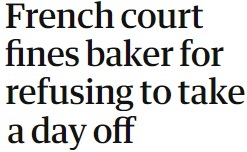 The French bureaucratic elite is pampered with costly perks and lavish compensation and the nation’s cossetted political class is famously self serving. And the regulatory system is a disaster, which not only hinders economic growth but also contributes to an erosion of social capital as people exploit the system and adopt an entitlement mentality. One reason for the bad tax system is that the French government consumes a huge share of economic output. 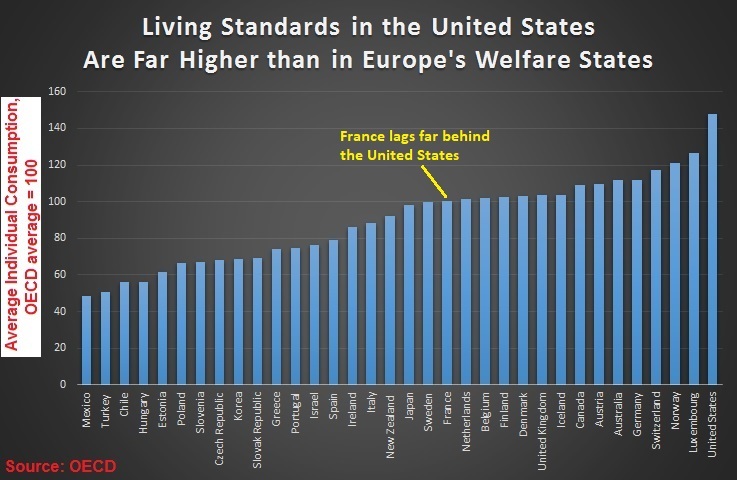 The welfare state is enormous as privileged sectors of the population get expensive handouts. It’s hard to pick which policy does the most damage. 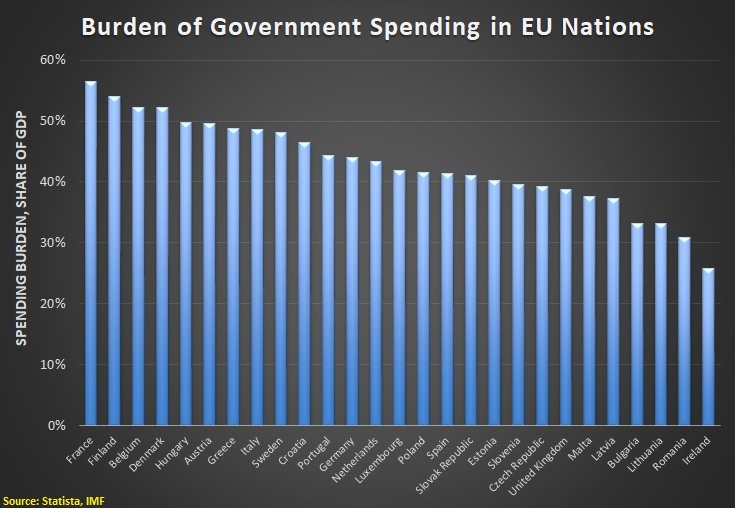 As a fiscal policy wonk, I’m tempted to blame France’s woes on high taxes and wasteful spending. 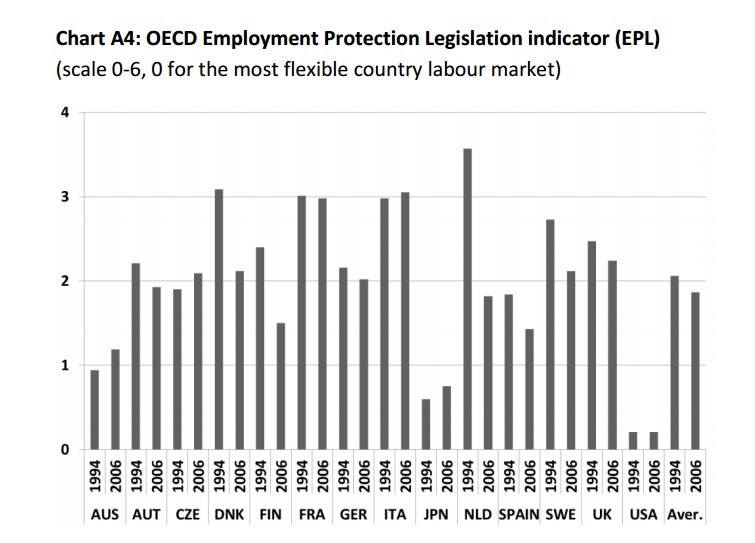 However, there’s a strong case that labor law is the worst feature of economic policy. France has all sorts of rules that “protect” employees, but the net effect is that workers suffer because these laws discourage entrepreneurs from creating jobs. And even though I get a lot of mileage out of making France a bad example, I actually hope that the nation’s new government will move policy in the right direction. Indeed, this is why I wanted France’s current President, Emmanuel Macron, to get elected. Yes, he used to be part of the previous socialist government that sought to make things worse rather than better. But I figured he was most likely to enact some pro-market reforms. And it appears my hopes may be realized, at least with regard to labor policy. The BBC reports on why Macron wants reform, what he wants to do, and what likely will happen. President Emmanuel Macron’s government has begun its drive to overhaul France’s rigid labour laws, vowing to “free up the energy of the workforce”. …France has an unemployment rate of 9.5%, double that of the other big European economies and Mr Macron has vowed to cut it to 7% by 2022. Here’s what he is proposing. The reforms aim to make it easier for bosses to hire and fire. …France’s labour code is some 3,000 pages long and is seen by many as a straitjacket for business. Among the biggest reforms, individual firms are to be offered more flexibility in negotiating wages and conditions. …If a business reached a deal with the majority of its workforce on working hours and pay that agreement would trump any agreement in the wider industry. …The government wants to facilitate deals at local level by encouraging companies with fewer than 50 employees to set up workers’ committees that can bypass unions. One of the thorniest problems for the government is how to make it easier for companies to dismiss staff. There is to be a cap on damages that can be awarded to workers for unfair dismissal. However, after months of consultations, ministers have agreed to increase the cap from their original proposal. The cap would be limited to three months’ pay for two years of work and 20 months’ pay for 30 years. Until now the minimum pay-out for two years’ employment was six months of salary. And he’ll probably get what he wants, both because some of the bigger unions have decided to play ball and also because he’s been granted authority to unilaterally make changes. Protests against the plan are expected next month, but two of the biggest unions say they will not take part. Jean-Claude Mailly, the leader of Force Ouvrière (FO), said that while the reforms were far from perfect, the government had carried out “real consultation” and FO would play no role in demonstrations on 12 September. The union with the biggest presence in the private sector, CFDT, said its members would not take to the streets either, although it was ultimately disappointed that its position was not reflected in the final text. …Mr Macron has already won parliamentary backing to push these reforms through by decree. An opinion poll on Wednesday showed that nine out of 10 French people agreed that their country’s labour code had to be reformed. Dalibor Rohac of the American Enterprise Institute has some analysis of what’s been proposed. …the National Assembly and Senate…authorized France’s government to amend the country’s byzantine labor code by executive orders… Prime Minister Édouard Philippe unveiled the details of the reform, divided into five decrees, on Thursday. So what exactly are they seeking to achieve? Perhaps most important is the introduction of caps on redundancy pay to those whose employment has been terminated without a just cause…stricter caps are introduced for small companies, for which large redundancy payments can be ruinous. It will also become easier for multinational companies to justify termination of employment on economic grounds. …it will be possible to downsize or close down French operations without having to subsidize them first from profits made overseas. …Companies with fewer than 20 employees will not have to rely on labor union representatives for their collective contracts. Subsidiaries of companies will have more freedom to offer temporary work contracts. Dalibor is not overly impressed by this collection of changes. …measured by the standards of what France needs, it is not much… The extent to which the reform elicits a strong reaction reflects purely the overregulated status quo, rather than the revolutionary nature of the proposed measures. …the government is doing something right, however timid. The Wall Street Journal‘s editorial is a bit more optimistic. French voters this spring gave themselves their best shot in a generation at reviving their moribund economy, and President Emmanuel Macron is now taking advantage of the opportunity. …the labor-market reforms he unveiled Thursday could remake the eurozone’s second-largest economy. …Mr. Macron will limit the severance payouts courts can mandate for fired workers. He will free small companies with nonunion workers from the straitjacket of national collective-bargaining agreements covering working hours, overtime pay, vacation benefits and the like. Companies will have more scope to negotiate labor deals at the firm level rather than being forced to abide by national agreements. By reducing the potential cost of employing workers, the reforms will lead to more employment. The severance overhaul will go a long way toward inducing businesses to hire more workers. Small- and medium-size French companies report pervasive fear of expanding their workforce lest they be stuck with problem employees or face ruinous expenses to lay off workers if economic conditions change. And France desperately needs reform. French unemployment is still 9.5% even at its five-year low. That’s double the rate in Germany, and French unemployment has become a social crisis, especially for young people frozen out of the job market. The jobless rate for French between age 15 and 24 is 25%—for those who haven’t moved to London or the U.S. Though the WSJ does recognize that the reforms are merely a modest step in the right direction. France isn’t becoming a laissez-faire paradise. Even if Mr. Macron’s labor overhaul takes effect, the French workplace will still be considerably more regulated than America’s. Let’s close with some excerpts from a story in the New York Times. …the government announced sweeping changes on Thursday with the potential to radically shift the balance of power from workers to employers. …an invigorated France is considered critical to the survival of a European Union that is finally showing signs of revival after a lost decade. …Economists in France and across Europe expressed optimism about the new law… France has stagnated for years under chronically elevated unemployment and slow growth. The country’s strong worker protections and expensive benefits have been blamed by some for being at least partly at the root of the problem. Wow, it must be bad if even the NYT is acknowledging that government is causing the economy to stutter. Amazingly, the story even admits that economic liberalization is the right way to get more job creation. For what it’s worth, I think the reference to German reforms is key. 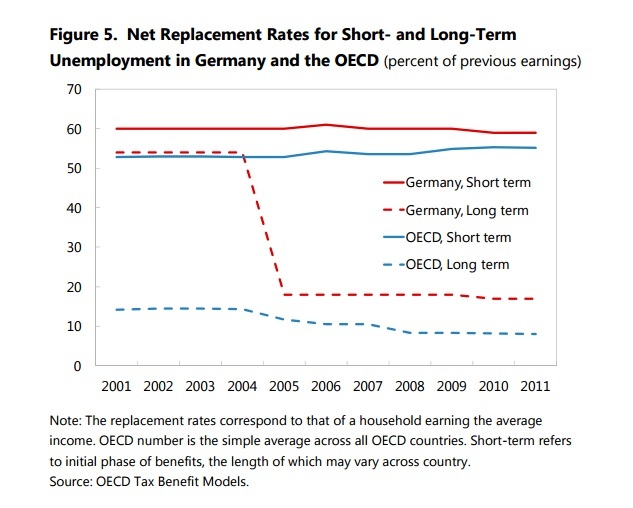 Under a left-leaning government, Germany liberalized labor markets. The so-called Hartz reforms were a huge success, slashing the jobless rate by more than 50 percent. I don’t know whether Macron’s reforms are as bold as what happened in Germany, but any movement in the right direction will create more employment. P.S. If Macron wants to save France, he better deal with the tax system as well. The problems are nicely captured by two videos, one about how young people are fleeing the nation and another showing a Hollywood celebrity reacting when told about the tax burden. P.P.S. Whenever I give a speech in France, I ask the audience whether their government (which consumes for the half of economic output) gives them more and better services than the Swiss government (which consumes about one-third of economic output). The answer is always an overwhelmingly no. P.P.P.S. I (sort of) agreed with Paul Krugman in 2013 that there is a plot against France. P.P.P.P.S. Last but not least, the French people occasionally do support good policy (and they’re willing to escape to America if things don’t get better).